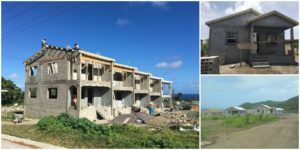 The Construction of over 130 homes around the island of St Kitts is underway, with some houses near completion. The Hon. Eugene Hamilton, Minister of Human Settlements, Community Development, Land and Cooperatives et al., is very pleased with the progress to-date on the construction of the first phase of houses under the new UNITY Housing Solution. Minister Hamilton makes almost daily or very frequent visits to the various Housing sites around the county in an effort to lend support to the Management and staff of the National Housing Corporation . In addition Hamilton uses the visits to relate with the contractors and workers and to monitor the progress of construction so that his promise of the delivery of these homes can come to fruition. More than 100 clusters, dwellings and townhouses are currently under construction in the Parishes of St. George, St. Thomas, St. Anne, St. Paul’s, St. Johns, Christ Church, St. Mary and St. Peters. Hon. Hamilton stated that some lots are cleared while others are in preparation for ground flooring, casting, installation of roofs, windows and doors and preparation for finishing. He also stated that over 80 Contractors and over 20 Heavy Equipment Operators have been employed with more to be contracted. Meetings have been had and work distributed to Finishers so that more people can be employed during this construction phase. The Minister also noted that these 130 plus homes are only Phase 1 of the Unity Housing Solution Program and that Phase 2 will begin within the upcoming weeks. The very first Ground-Breaking Ceremony was held in March, 2017, with the promise of delivering 300+ houses under 1.5 years. The construction of over 130 Homes has resulted in the engagement of some 80 PLUS Contractors, with an average of roughly 8 persons working on each house thre is a total of over 1000 persons working on the houses as Plumbers, Tilers, Painters, Masons, Carpenters, Electricians, Labourers and more.